The market is moving the needle, but CPP would move it further and faster. The full bench of the U.S. Court of Appeals is set to hear arguments on the Clean Power Plan on September 27. The court called for an en banc review earlier this year, foreseeing that any outcome of a three-judge panel review would have been insufficient and a full court would be requested. In February, the U.S. Supreme Court voted 5-4 to stay the implementation of the U.S. Environmental Protection Agency’s Clean Power Plan until the carbon rule has been fully reviewed on its merits. Ten judges will hear the case next week. (Chief Justice Garland has recused himself because of his nomination for the Supreme Court.) 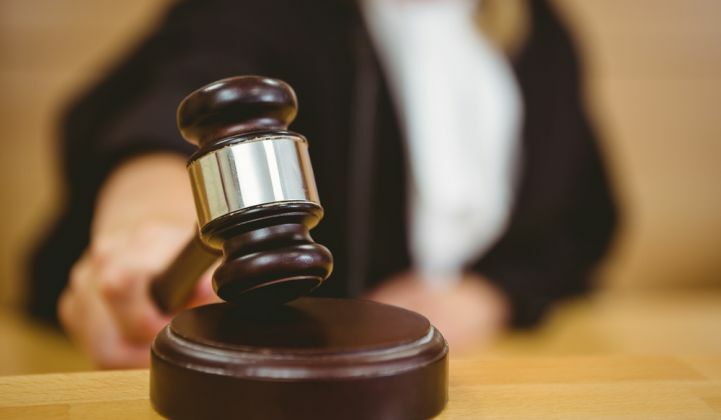 The outcome of the case is important as it will frame the arguments before they reach the Supreme Court at a later time, which the case is expected to do no matter what the ruling of the U.S. Court of Appeals turns out to be. The states fighting the plan insist it’s not about compliance, as that is already happening, but rather about states’ rights. The CPP seeks to cut pollution from the power sector by 32 percent by 2030 and spur investments in clean energy. Compliance may come easier to some states, such as Colorado, which has a renewable portfolio standard, but not for others, such as West Virginia, a coal-heavy state that is leading the charge against the CPP. While the CPP would quicken the demise of the oldest and most inefficient power plants and help increase energy efficiency in the least efficient states, market drivers are beginning to push renewables and efficiency in some, but not all, regions. The nine states that participate in the Regional Greenhouse Gas Initiative, for example, could easily hit 2030 levels without any significant changes, according to Jackson Morris, director of Eastern energy at the Natural Resources Defense Council. In other states, including Texas, which is fighting the CPP, utilities are building solar projects because it’s just good business. GTM Research estimates nearly one-third of the utility-scale solar pipeline now consists of voluntary projects, rather than those driven by renewable portfolio standards. An analysis by the Environmental Defense Fund found that three-quarters of the states suing to block the CPP are on track to meet the 2024 targets. But the later, more stringent goals would be called into question, especially for states that do not invest as much as others do in energy efficiency or have market rules that allow for more clean, distributed generation. “It’s a question of timing, not a question of if,” Ralph Izzo, CEO of PSEG, told E&E Publishing earlier this year. But the issue of timing is no trivial matter. Utilities make decisions years in advance for generation and transmission investments that can take many more years to get built and then remain in operation for decades. The decisions made in the next few years will have ramifications through 2040. 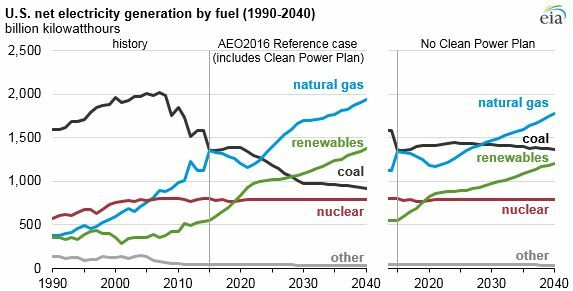 In the Energy Information Administration’s 2016 reference case, for example, renewables will overtake coal as a share of U.S. power generation by 2030 with the Clean Power Plan. But without CPP, coal still remains a greater share of the power mix. In both cases, natural gas becomes the dominant fuel source. If the CPP does go into effect as it is currently written, it could be energy efficiency that is the biggest winner, with the rules raising the bar for all states. It would bring more stringent rules to efficiency programs and confidence that the savings are real, which could further animate the market.